The eagle is the common name data to some birds of order of the Falconiformes, in the family of the Accipitridae who are generally carnivorous raptors. The name is attributed to birds of diverse genera, thus there are several types of eagles. They have an excellent visual acuity, enabling them to locate their prey from considerable distance. They mainly feed on rodents, but birds and lizards are also seized. Like all the predatory raptors, the eagles have large claws to seize their prey, and powerful legs. Eagles are found mainly in Europe, Asia and Africa. Two species, are found in North America, these being the Golden Eagle and Bald Eagle. 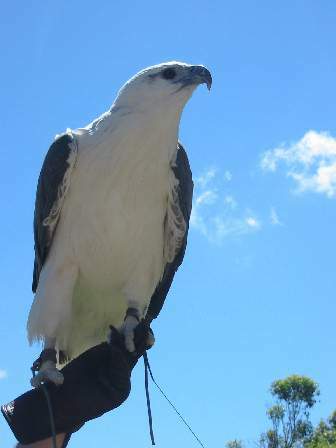 Two more species inhabit Australia (the Wedge-tailed Eagle and White-bellied Sea Eagle), and some are also found in South America. The Golden Eagle is often considered to be the chief of the true Eagles. It is estimated that a Golden Eagle circling in the sky can see small prey, like a rabbit, a mile away. The Golden Eagle's predacious habits make it a type of bird which prefers not to associate with groups of its kind. Any animal which lives chiefly, if not wholly, by the chase, requires a large district in order to enable it to live, and thus even where Golden Eagles are comparitively common, twenty or thirty eagles will be scattered over an area of twice the number of miles. Like the lion among the mammals, the Eagle leads an almost solitary life, scarcely ever associating with any of its kind except its mate and its young. Although it lives principally by the chase, it has no objection to carrion, and may he seen feeding on a dead animal in company with the lesser vultures, though it retires before the lordly griffon. Being so thinly scattered, it would not be so conspicuous a bird as the griffon, which is not only very much larger, but associates in great numbers. With its astounding eyesight, the Golden Eagle can spot a rabbit from a distance of a mile away. There are around 400 pairs in Scotland as at the year 2006. Four or five species of Eagle are known to inhabit Palestine. There is, for example, the Imperial Eagle, which may be distinguished from the Golden Eagle by a white patch on the shoulders, and the long, lancet-shaped feathers of the head and neck. These feathers are of a fawn colour, and contrast beautifully with the deep black-brown of the back and wings. It is not very often seen, being a bird that loves the forest, and that does not care to leave the shelter of the trees. Then there are several of the allied species, of which the best example is perhaps the Short-toed Eagle, a bird whose numbers have declined in Europe but the numbers of which exist in the Middle East are still plentiful enough to ensure it it is not yet threatened there. The Short-toed Eagle is seldom a carrion-eater, preferring to kill its prey for itself. It feeds mostly On serpents and other reptiles, and is especially fond or frogs. It is a large and somewhat heavily built bird, lightness and swiftness being far less necessary than strength in taking the animals on which it feeds. It is rather more than two feet in length, and is a decidedly handsome bird, the back being dark brown, and the under parts white, covered with crescent-shaped black spots. The eagle is the of symbol many organizations and nations, it represents the ideas of beauty, force and prestige. The Romans used it as emblem for their armies, and the Eagle is a national emblem of the United States . On the flag of Mexico an eagle on a cactus with a snake in its mouth is represented. This is a reference to the foundation myth of Tenochtitlan, the city which originally stood where Mexico City is now located. Also in Germany, Romania and Albania the eagle has high symbolic value. In the Christian Bible no definite species of Eagle seems to be mentioned, but there is little doubt that the Eagle is one of the many birds of prey that seem to have been classed under the general title of Asniyeh - the word which in the Authorized Version of the Bible is rendered as Osprey. A similar confusion is observable in the modern Arabic, one word, ogab, being applied indiscriminately to all the Eagles and the large falconidae. The lofty hights which eagles can be seen to nest is obseved in the passage in JER. xlix. 16, 'Though thou shouldest make thy nest as high as the eagle. '.